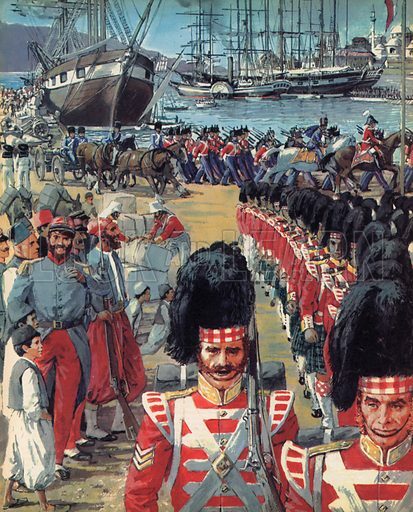 This fine picture presents a crowded canvas showing the temporary disembarkation of British troops in Malta before sailing on to fight in the Crimean War. For the military the glory and honour of the British Empire and Crown are at stake, regardless of the Realpolitik involved, and the gleaming gilt epaulets and braided scarlet uniforms symbolise that implacable determination to prevail. Many more pictures of the Crimean War can be found at the Look and Learn picture library.